Austria's finest extreme metal open air since 2003. 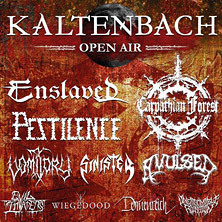 In summer 2019, Kaltenbach Open Air, Austria's most renowned and legendary Extreme Metal Festival, takes place for the 14th time. Following the event's tradition, it once again welcomes its visitors in front of the spectacular backdrop of the Styrian Alps nearby the small village of Spital am Semmering. For three days headbangers from far and wide will set the mood and create a unique atmosphere. Not only has the outstandingly impressive location highlighted this festival, but also an annual star-studded billing. From 22 to 24 August 2019 the ground will be shaken by established heavyweights and ambitious newcomers.